One day, something fell from the sky. Xi had never seen anything like this in his life. It looked like water, but it was harder than anything else in the world. He wondered why the gods had sent this thing down to the earth. It was the strangest and most beautiful thing they had ever seen. They wondered why the gods had sent it to them. Where any other person would die of thirst in a few days they live quite contentedly in this desert that doesn't look like a desert. The Gods Must Be Crazy is a 1980 film about a traveling Bushman who encounters modern civilization and its stranger aspects, including a clumsy scientist and a band of revolutionaries. Written and directed by Jamie Uys. In the Kalahari, it's always Tuesday, or Thursday if you like. Or Sunday. No clocks or calendars tell you to do this or that. That is a very evil thing you've got. You better give it back so I can take it and throw it off the earth. It looks like a paradise, but it is in fact the most treacherous desert in the world, the Kalahari. After the short rainy season there are many water holes, and even rivers. But after a few weeks, the water sinks away into the deep Kalahari sand. The water holes dry, and the rivers stop flowing. The grass fades to a beautiful blond colour that offers excellent grazing for te animals. But for the next nine months, there will be no water to drink. So most of the animals move away, leaving the beautiful blond grass uneaten. Humans avoid the Kalahari like the plague because man must have water to live. So the beautiful landscapes are devoid of people. Except for the little people of the Kalahari. Pretty, dainty, small and graceful, the Bushmen. Where any other person would die of thirst in a few days they live quite contentedly in this desert that doesn't look like a desert. They know where to dig for roots and bulbs and tubers and which berries and pods are good to eat. And, of course they know what to do about water. For instance, in the early morning, you can collect dewdrops from leaves that were carefully laid out the previous evening. Or a plume of grass can be a reservoir. And if you have the know-how, an insignificant clump of twigs can tell you where to dig and you come to light with an enormous tuber. You scrape shavings off it with a stick that is split to give it a sharp edge. You take a handful of the shavings, point your thumb at your mouth and squeeze. They must be the most contented people in the world. They have no crime, no punishment, no violence, no laws, no police, judges, rulers or bosses. They believe that the gods put only good and useful things on the earth for them to use. In this world of theirs, nothing is bad or evil. Even a poisonous snake is not bad. You just have to keep away from the sharp end. Actually, a snake is very good. In fact, it's delicious. And the skin makes a fine pouch. They live in the vastness of the Kalahari in small family groups. One family of Bushmen might meet up with another family once in a few years. But for the most part, they live in complete isolation quite unaware there are other people in the world. 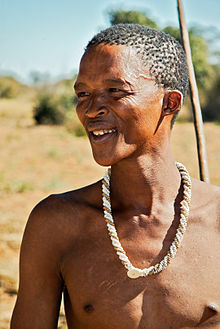 In the deep Kalahari, there are Bushmen who have not seen or heard of civilized man. Sometimes they hear a thundering sound when there are no clouds in the sky. And they assume the gods have eaten too much and their tummies are rumbling up there. Sometimes they can even see the evidence of the gods' flatulence. Their language has an idiosyncrasy of its own. It seems to consist mainly of clicking sounds. They're very gentle people. They'll never punish a child or even speak harshly to it. So, of course the kids are extremely well-behaved. And their games are cute and inventive. When the family needs meat the hunter dips his tiny arrow in a brew that acts as a tranquilliser. When he shoots a buck, it feels a sting and the arrow drops out. The buck runs away, but soon it gets very drowsy and it stops running. After a while, it goes to sleep. And the hunter apologizes to his prey. He explains that his family needs the meat. The one characteristic which really makes the Bushmen different from all other races is that they have no sense of ownership at all. Where they live, there's nothing you can own. Only trees and grass and animals. In fact these Bushmen have never seen a stone or a rock in their lives. The hardest things they know are wood and bone. They live in a gentle world, where nothing is as hard as rock, or steel or concrete. Only 600 miles to the south, there's a vast city. And here you find civilized man. Civilized man refused to adapt himself to his environment. Instead he adapted his environment to suit him. So he built cities, roads, vehicles, machinery. And he put up power lines to run his labour-saving devices. But he some how didn't know when to stop. The more he improved his surroundings to make life easier the more complicated he made it. So now his children are sentenced to 10 to 15 years of school, just to learn how to survive in this complex and hazardous habitat they were born into. And civilized man, who refused to adapt to his surroundings now finds he has to adapt and re-adapt every hour of the day to his self-created environment. For instance, if the day is called Monday and the number 7:30 comes up, you have to dis-adapt from your domestic surroundings and re-adapt yourself to an entirely different environment. 8:00 (8-double-zero) means everybody has to look busy. 10:30 (ten-three-zero) says means you can stop looking busy for 15 minutes. And then, you have to look busy again. Your day is chopped into pieces. In each segment of time you adapt to new circumstances. But in the Kalahari, it's always Tuesday, or Thursday if you like. Or Sunday. No clocks or calendars tell you to do this or that. Lately, strange new things sometimes appeared in the sky. Noisy birds that flew without flapping their wings. One day, something fell from the sky. Xi had never seen anything like this in his life. It looked like water, but it was harder than anything else in the world. He wondered why the gods had sent this thing down to the earth. It was the strangest and most beautiful thing they had ever seen. They wondered why the gods had sent it to them. Pabo got his finger stuck in the thing and the children thought he was very funny. Xi tried the thing out to cure thongs. It had the right shape and weight. It was also beautifully smooth and ideal for curing snakeskin. And Pabo discovered you could make music on it. And every day they discovered a new use for the thing. It was harder and heavier and smoother than anything they'd ever known. It was the most useful thing the gods had ever given them. A real labour-saving device. But the gods had been careless. They had sent only one. Now, for the first time, here was a thing that could not be shared because there was only one of it. Suddenly, everybody needed it most of the time. A thing they had never needed before became a necessity. And unfamiliar emotions began to stir. A feeling of wanting to own, of not wanting to share. Other new things came. Anger, jealousy, hate and violence. The most inquisitive creature in Africa is the baboon. Xi said [to the baboon after it took away the Coca cola bottle], "That is a very evil thing you've got. You better give it back so I can take it and throw it off the earth. It brought unhappiness to my family. If you don't give it to me it'll bring grief to you and your family too." He spoke long and earnestly until the baboon began to pay attention. He must have convinced it, and it dropped the thing. And Xi said, "You have done a very wise thing. One day, a very noisy animal rushed past where Xi was sleeping. It left very peculiar tracks, as if two enormous snakes had slithered past. The rhino is the self-appointed fire-prevention officer. When he sees a fire, he rushes in and stamps it out. That morning, Xi saw the ugliest person he'd ever come across. She was as pale as something that had crawled out of a rotting log. Her hair was quite gruesome long and stringy and white, as if she was very old. She was very big. You'd have to dig the whole day to find enough food to feed her. Although it was a hot day, she was covering her body with skins that looked as if they were made from cobwebs. She was doing strange and magical things, and it struck him that she must be one of the gods, and he wondered what she was doing on Earth. But he was glad he met her. He'd give her the evil thing and go home to his family. He said tactfully that he didn't need the thing, and she could have it back. But she was very rude, and she walked away. There was another god. He had a fire inside him, and the smoke came out through his mouth and nostrils. Xi said politely, "It was kind of you to send us this thing but it made my family unhappy. Please take it back. " There was a peculiar sound, and then Xi saw a most amazing animal approaching. It's legs went around instead of up and down. And there was a weird-looking god on its back. He wore a blue skin on his head and red one on his body. And hair grew on his face. The funny thing about these gods was that they couldn't speak. They could only make chattering sounds like monkeys. If you make a fire, and a rhinoceros sees it he comes and stamps it out. Rhinos do that. It's a most interesting phenomenon. Miss Thompson, if you make a fire, and a rhinoceros sees it he comes and stamps it out. Rhinos do that. It's a most interesting phenomenon. They're Tswanas. They always shake their heads when they mean to say yes. She thinks I'm a lunatic and I don't blame her. You know she asked me what do I do? And I said I collect manure. I don't tell her that I analyze it for my doctoral thesis. I bet she thinks that I shovel the stuff. Sir! Sir! Some people went through here. They didn't show me their passports and They smashed down the barrier. They've got guns. This is Frank speaking, Sir . Do you speak English? You are free to remain silent until you have seen your lawyer. But if you choose to speak now, whatever you say will be taken down as evidence against you. You don't want to talk about it, huh? Shame. And why are you so beautiful? You better do your thing before the pupils come. You killed three, and wounded five, and you lost four. Stop playing that bloody game. [threatening the sergeant, while holding Kate Thompson at gunpoint] Sergeant, I'm going to walk due east from here to Motambe and I'm taking all these kids with me. If I see one truck, or one aeroplane, or one policeman, or one soldier, or one person, we'll mow these kids down. Woman (at the Restaurant): Does the noise in my head bother you? Kate: Still got that story about the teacher shortage in Botswana? Pete: Yeah. You gonna use it? Kate: No. Maybe they can use me. Kate: Do you work here in Botswana? Mr. Steyn: Yes, I... yes. Kate: And what do you do? Mpudi: And why are you so beautiful? Mr. Steyn: I'm going to the school to give her these. Mpudi: You gonna look like that? Mpudi: Like it's a funeral. You've gotta smile and tell her she looks good. Mr. Steyn: How are you an expert on women? Mr. Steyn: Why aren't you at home with them? Mr. Steyn: So, what did you marry them for? Mpudi: Someday I have to tell you the facts of life. Mpudi: You gonna look like that forever? Mpudi: Like Jack Hind is better than you. Mr. Steyn: No, I'm going to talk to her. Mpudi: Tell her you were the big hero. Mr. Steyn: No, I can't do that. But I do want to talk to her. I'll tell her. I'll say, "Look, Miss Thompson. I know you think I'm an idiot but normally I'm quite normal. It's only when I'm in the presence of a lady that I... It's really just an interesting psychological phenomenon. If a man who is susceptible to a type of para-Freudian syndrome like this encounters a nubile female, what happens?" Mpudi: I suppose another big word happens. Mpudi: Yeah, whatever that means. Mpudi: Wait for me. You need moral support. Mr. Steyn: Morning, Miss Thompson. Mr. Steyn: How are you? Kate: Fine, thanks. How are you? Mr. Steyn: Fine, thanks, and how are you? Kate: I'm fine, thank you. Mr. Steyn: Kate. I know you think I'm an idiot but I'm not really like that. It's only when I'm around wom...Around you. I'm sorry. Normally, I'm quite normal. But whenever I'm in the presence of a lady my fingers turn into thumbs, my brain switches off. Mr. Steyn: It's actually, Actually, it's really only an interesting psychological phenomenon. Perhaps it's some Freudian syndrome. When I brought you your shoes, I came to apologise for the stupid things I did when I met you at Mabula. To explain that I'm not as stupid as that. But then, of course, I blew it, and I, So I don't blame you if you think But it's really only an interesting psychological. When you get to know me better, you'll see that I'm not always stumbling. It's really just an interesting psychological phenomenon. Kate: Yes, you are a very interesting psychological phenomenon. And I think you're very sweet. and because the film is intelligent, it's one of the only slapstick comedies since the Marx Brothers that really works. ... Some might complain that the film's treatment of the Bushmen is not too accurate — Bushmen are not this clueless about the ways of the white man — but most of the white characters in the movie are just as goofy, so the film's pretty even-handed in that respect. The star of the movie is N!xau, who is so forthright and cheerful and sensible that his very presence makes some of the gags pay off. In any slapstick comedy, the gags must rest on a solid basis of logic: It's not funny to watch people being ridiculous, but it is funny to watch people doing the next logical thing, and turning out to be ridiculous. N!xau, because he approaches Western society without preconceptions, and bases all of his actions on logical conclusions, brings into relief a lot of the little tics and assumptions of everyday life. I think that reveals the thought that went into this movie: It might be easy to make a farce about screwball happenings in the desert, but it's a lot harder to create a funny interaction between nature and human nature. This movie's a nice little treasure.